Humanity is always fascinated with the unknown, and what could be more unknown than what's inside us, killing us slowly and unpredictably? The Pulitzer-prize-winning, The Emperor of All Maladies, is brought to life on stage, to challenge our ideas of the right ways to talk about something as complex as cancer. Stories about cancer that we are familiar with, are tales of survival or death. But the story of the struggle against cancer is one of resilience, of hope and hopelessness all woven together. 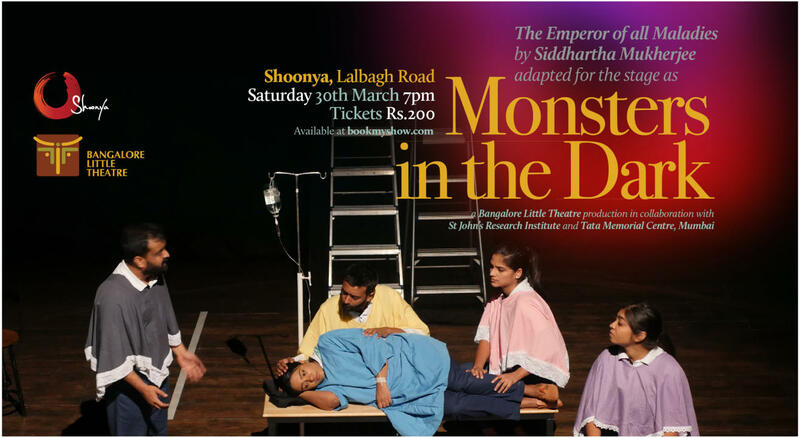 This play is an effort to tell the story of cancer as it is - the trails, tribulations and the magic that human endurance can bring about in our fight against this beast. Come with us as we peek into the lives of some of the people who shaped our war on cancer, from a humble mouse to a poor weak cancer survivor who won legal battles to the doctors who put their profession before love, life and happiness. It is a magnificent, profoundly humane “biography” of cancer—from its first documented appearances thousands of years ago through the epic battles in the twentieth century to cure, control, and conquer it to a radical new understanding of its essence. Physician, researcher, and award-winning science writer, Siddhartha Mukherjee examines cancer with a cellular biologist’s precision, a historian’s perspective, and a biographer’s passion. e result is an astonishingly lucid and eloquent chronicle of a disease humans have lived with—and perished from—for more than five thousand years. At 58, Bangalore Little Theatre or BLT is Bangalore’s oldest English language theatre group. BLT got going in 1960 as a membership-driven organization. It functioned with an amateur, non-commercial status. ere was no income for any member from any of the group’s activities then. These features gave BLT a good part of the character it maintained over many years. It was the theatre for the love of the theatre, and the love of the theatre held it together as a large, happy family. Collectively, the group had a united vision of a Community Theatre best described by a slogan invented 25 years later: Think Globally, Act Locally. Having performed over 200 plays, the group has certainly been productive...and creative. BLT is admired for the quality of its productions, setting benchmarks for many other theatres in Bangalore. Over the years we have become deeply involved in training, education, outreach programmes and a range of developmental activities. Old-timers of BLT have often been asked the secret of the group’s long life when, in contrast, we see hundreds of cases of groups starting with a bang and dropping by the wayside in a couple of years. e difference, it seems, is in a simple fact that BLT is a participation-organization and, therefore, a genuine theatre community. Into its sixth decade. With every likelihood of a long and happy lifespan ahead. e conduct of affairs have always been professional, with best practices in organization and management brought into all that the group did.